Spicy Fennel with Olives & Orange – Slow Cooker Style! Happy 2015, everyone! Here’s a wonderful slow cooker dish I recently discovered in my Williams-Sonoma New Slow Cooker Cookbook (by Brigit Binns). Do you think of veggies in a slow cooker as mushy, dull and flavorless? Well, as I’m learning, that’s simply not true. This cookbook is full of contemporary slow cooker dishes with crunchy side dishes like corn salsas or wonderful salads with easy vinaigrettes. If you’ve never cooked with fennel, I promise it’s actually quite easy. Don’t get weirded out by its funny shapes in the picture above. Once you slice off the green tops you have something similar to a small onion in size to work with – and like an onion it’s got lots of fantastic layers…but unlike an onion, fennel’s flavor has a subtle hint of black licorice. So nope, no eyes tearing up like you might sometimes experience chopping an onion. This dish is perfect as a vegetarian or vegan main course (just substitute vegetable stock for the chicken stock called for) or as a side dish. 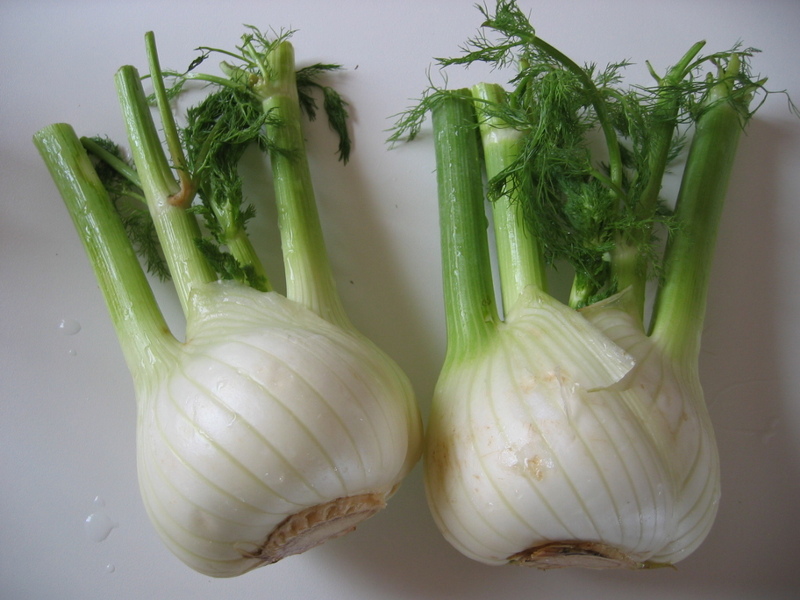 Cut off the green stems and feathery tops and any bruised outer stalks from each fennel bulb. Chop the feather tops to yield 2 T and set aside. Quarter each bulb lengthwise, then halve each quarter lengthwise and trim away the core, leaving just a little of the core intact to hold each wedge together. You should have 16 wedges. Place the fennel in a slow cooker. In a small, heavy frying pan over medium-high heat, warm the oil. Add the shallot and sauté until lightly golden, about 4 minutes. Add the garlic and pepper flakes to taste and cook for 1 minute more. Pour in the wine and vinegar and stir to dislodge any browned bits on the pan bottom. Stir in the stock, oregano sprigs (or dried oregano), 1/2 tsp salt and several grinds of pepper. Transfer the contents of the pan to the slow cooker. Cover and cook on the low setting for 2 1/2 hours. The fennel should be tender but not mushy. Just before the fennel is ready, grate the zest from the orange and set aside. Then, trim away the remaining rind and segment the orange. Coarsely chop the orange segments. Using a slotted spoon, transfer the fennel wedges to a warm platter. Taste the braising liquid and adjust the seasoning with salt pepper and a little more vinegar, if needed. Spoon some of the liquid over the fennel wedges and scatter the fennel tops, olives, grated orange zest and orange segments over the top. Drizzle with olive oil and serve. Fivenineteen notes: the flavors in this dish are incredible. The orange adds a sweet, sunny note, while the red pepper flakes bring a little spicy heat. The black olives are earthy and salty, and the anise-flavored fennel tops add freshness. Delicious! I used a 3 quart slow cooker with a ceramic insert, and I could have probably let the fennel go a full 3 hours, rather than the 2 1/2 hours the recipe calls for. You’ll want your fennel tender, not mushy, so keep an eye near the end to see what works for you. I try to avoid opening the slow cooker lid as much as possible as it interferes with the cooking process; the slow cooker will take a while to readjust to the right temperature after the lid is opened and that hot, moist air escapes. But sometimes you need to open it and check your food’s progress. If you’re using fresh oregano springs, strip off the leaves from the stem and tear gently. No need to mince them before adding. It didn’t seem like there was enough braising liquid when I was sautéing the shallots, garlic and adding in the vinegar and wine. But it turned out great, and I’ll definitely make this recipe again.